Extracts of wild garlic (Allium ursinum) and garlic (A. sativum) with defined chemical compositions were investigated for their in vitro inhibitory potential on 5-lipoxygenase (LO), cyclooxygenase (CO), thrombocyte aggregation (TA), and angiotensin I-converting enzyme (ACE). The inhibition rates as IC50 values of both extracts for 5-LO, CO, and TA showed a good correlation with the %-content of the major S-containing compounds (thiosulfinates and ajoenes) of the various extracts. 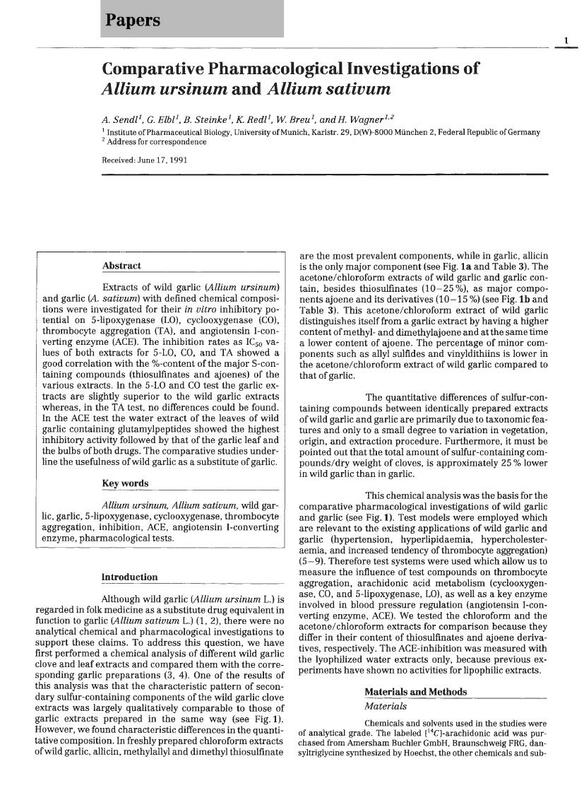 In the 5-LO and CO test the garlic extracts are slightly superior to the wild garlic extracts whereas, in the TA test, no differences could be found. In the ACE test the water extract of the leaves of wild garlic containing glutamylpeptides showed the highest inhibitory activity followed by that of the garlic leaf and the bulbs of both drugs. The comparative studies underline the usefulness of wild garlic as a substitute of garlic.